The power of this photo has stayed with me ever since I saw it years ago. I have been thinking about it recently. Lee Miller was a model turned photographer. She was an assistant and lover of Man Ray while living in Paris. She later became a photo journalist, and the official war time correspondent for Vogue during Wold War II. 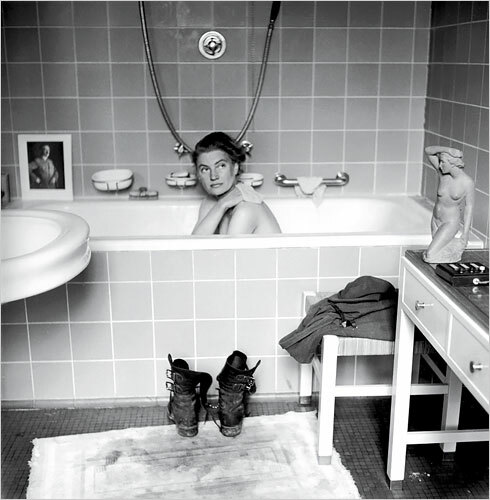 The photo above is of Miller in Hitler's bathtub. She snuck into his Munich apartment after the fall of Berlin in 1945. She later explained, "I had his address in my pocket for years." WHOA! so cool...lee miller. what a lady! So many parallels with your posts...decluttering, letting go of things...we'll have a lot to talk about tomorrow! there are lots of great photos of her by man ray, check 'em out.